Why Book through a Travel Agency? I hope you find it interesting and informative. Obviously, as one of the owners of Direct Line Cruises, I would tell you to go no further in your search for a cruise because I am confident that you will find all of the important, accurate and valuable information that you need to make a reservation for the cruise that will best suit your needs and desires right here on this site. I am also confident that our expert staff will provide you with answers to any additional questions you may have. If you would like more information regarding Direct Line Cruises, please visit our About Us page. If you are just starting to shop, you may decide that the best thing to do is to get information from more than one source, and as a consumer, that makes perfect sense to me. Shopping for a Cruise can be fun and exciting, but if you have done this before, then you know it can also be confusing and sometimes frustrating – more so, if you have not done this before. Booking a Cruise requires a higher level of understanding than other travel purchases. There are so many different options out there and so many decisions to make. How can you be certain you are choosing the right cruise line or ship? Choose the wrong cruise line or ship and your vacation will turn out to be a big disappointment. This is a rather long letter that may or may not persuade you to book with Direct Line Cruises. However, I believe it is worth the time because I am certain that the content of this letter will provide you with numerous compelling, credible and beneficial reasons to book your cruise with a Travel Agency vs booking direct with the cruise line. Many first-time cruisers see an appealing ad online or in the newspaper for a particular cruise line or ship and think that calling that particular cruise line direct is the way to go. So, why is this a mistake? Consider this…. Like a Cruise, shopping for an automobile can also be fun, exciting, confusing and frustrating with a multitude of options. You would not go to a Chevrolet site or walk into the dealership and expect to get unbiased information as to which automobile would be best for you. The Chevy dealer is not going to explore the Cadillac options with you to be certain you are choosing the most appropriate automobile for you and your family. The Chevy dealer wants to sell you a Chevy, regardless of whether it is the right choice for you or not. In order for you to have all of the information you need to make the right choice, you would need to visit many websites and talk to many dealers. And, each one of those dealers will tell you that their automobile is the right one. There really is no “one-stop shopping” for an automobile. There is “one-stop shopping” for Cruises – The Travel Agency. The cruise lines are extremely reputable and offer wonderful vacation experiences. I can’t think of any that I have sailed on that I would not recommend. However, a cruise line that caters to the 25 to 45 age group who is looking for active and thrill-seeking fun for the family with zip lining, rock climbing, sky riding, bumper cars, go carts, simulated surfing and 16-story water slides is not one that I would recommend to the 50 to 75 age group who is looking for a more subdued, quiet and relaxed experience. A skilled Travel Agent would not recommend a pricy luxury cruise line to someone who wants a good experience, but needs to mind his/her budget a bit more. A skilled Travel Agent knows the importance of listening closely to hear about the types of vacations that have appealed to a person in the past. Some people would appreciate a more intimate atmosphere on a smaller ship. They may prefer small cozy piano lounges or savoring the soft sounds of a string quartet, while some would enjoy lively bands, comedy clubs and lounges that stay open all night. What’s you style – an occasional formal night or is it casual all the way? Some love the energy of the mega-ships. Some ships offer more dining, spa, activity and entertainment choices than others. Some have casinos. Others do not. Some offer more educational and cultural opportunities while onboard. Some cater to those who want their Cruise vacation to be all about exploring the world on adventurous expeditions. What about a River Cruise? Is that right for you or your family? How can you be sure? Are you considering a Suite for your family? Maybe two staterooms would offer more in size and accommodations and cost less money. Did you know that some cruise lines include all beverages (including alcohol), gratuities, shore excursions and dining at specialty restaurants in their total cruise fare? Maybe there are two cruise lines that would suit your needs, but one is offering a phenomenal promotional rate with some very nice additional onboard, value-add amenities. And, the list of distinct and diverse options go on and on. An experienced Travel Agent will not only point you in the right direction, he or she will save you time by sorting through and clarifying all of the complex details and save you money because they are aware of and have access to the special deals and promotions of all cruise lines. Booking your Cruise directly with one particular cruise line is like walking into only one automobile dealership and buying that automobile without knowing what else is out there, and therefore not knowing whether it is the best for you among so many other automobile choices. The agents at the cruise lines are capable people, and if trained well, know how to handle inquiries about the cruise product they sell. They know what they have to offer for that particular cruise line. Like the automobile dealers, the agent at the cruise line cannot disclose anything about another cruise line that may better suit your needs. They do not know what the other cruise lines are offering. Booking a Cruise through a Travel Agency is buying the Cruise that IS THE BEST FOR YOU! 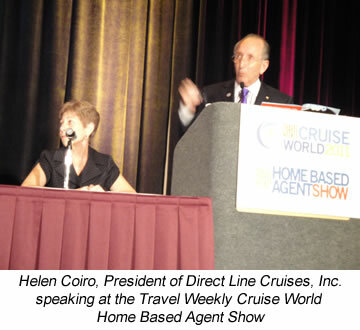 Complexity of Booking Cruises was a major theme discussed at Cruise Line International Association’s (CLIA) Cruise 360 Conference in Vancouver in June 2016. Several top cruise industry executives said “they don’t envy the job of today’s travel seller”. •	Adam Goldstein, President and COO of Royal Caribbean Cruises said, “Agents are in the information management business. There are way too many choices for a customer to understand – even if they are avid travelers”. 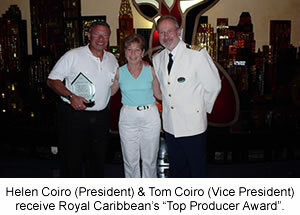 •	Rick Sasso, Chairman of MSC Cruises North America said, “You guys have a tougher job than we do. I only know everything there is to know about MSC and that’s a lot, and we expect you to know all of this and everything about 20 other brands”. •	Christine Duffy, President of Carnival Cruise Line said, “The lines are counting on agents who sell its products to be experts. Given the number of brands / options / different classes of ships within a brand / different itineraries, the Travel Agent is the best resource to really help people navigate to be sure they get on the right cruise”. •	In a separate interview, Arnold Donald, CEO of Carnival Cruise Line said that a cruise is a complex purchase and that people need to be in contact with an expert consultant. He said, the right Travel Agent will save you a ton of time, and get you much better information, accurate information and increase the probability that you are going to have a great experience. •	Frank DelRio, President and CEO of Norwegian Cruise Line Holdings said this about Travel Agents at a Vacation.com conference. “You are key to being able to seamlessly explain and sell thousands of products that are out there and fit that customer to the right brand, the right experience. You are the gatekeepers”. New findings from the American Society of Travel Agents (ASTA) as a result of a study conducted by market research firm TNS Global proves that Travel Agents save consumers both time and money. The findings of the study are that Travel Agents save consumers an average of $452 per trip and four hours in travel planning. Most importantly, consumers said that agents help them avoid costly mistakes. In addition, the total price of your cruise vacation may be different depending on whether you book direct or with a Travel Agency. I will tell you that more often than not, the total price of your Cruise booked at Direct Line Cruises will be equal to or less than the price you would pay by booking directly with the cruise line. In many cases, Direct Line Cruises can offer promotional rate advantages and provide very attractive value-add amenities such as on board spending credit that the Cruise line may not be offering. And for all cruises, cancellation protection is always included in our price. ise line courses and achieved Certification Certificates from most of the major cruise lines recognizing them as knowledgeable experts of that cruise line. They are educated and experienced professionals who understand the importance of finding the right Cruise vacation for you. The travel industry uses many different terms for Travel Agents. They are also called Travel Counselors, Travel Consultants and Travel Advisers. To be worthy of any of these names, they know that they must pay attention to detail, listen well and then precisely guide you into making the right choice based on a thorough qualifying process. Travel Agents are the most excellent consultative source to go to when booking a Cruise vacation. The knowledgeable agents at Direct Line Cruises do this every day with the utmost confidence and with a minimum amount of pressure. Thank you for your time and I wish you Beaucoup Bon Voyages! 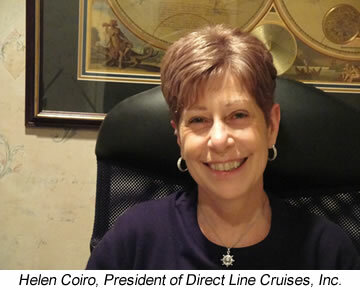 Helen Coiro, President, Direct Line Cruises, Inc.